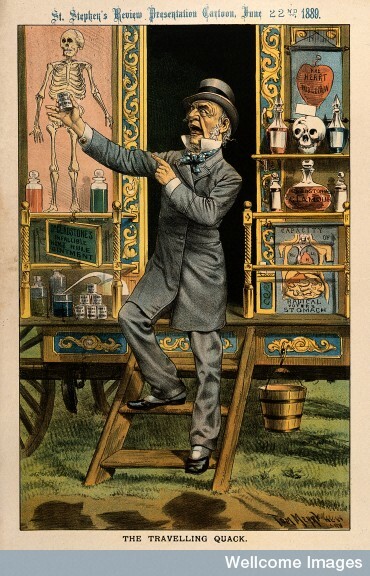 Disrupted Physician 101.1: The “Impaired Physician Movement” and the History of the American Society of Addiction Medicine (ASAM). And in the year 2014 Stimson’s characterization of the “impaired physician movement” remains as accurate and apt as it was in 1985. But the “number of evangelical recovered alcoholic and addict physicians” has increased dramatically (outnumbering Addiction Psychiatry by 4:1) and their involvement in “ medical society and treatment programs” has been realized and enforced through the state Physician Health Programs and their “PHP-approved’ assessment and treatment centers. Their “ability to make authoritative pronouncements on physician impairment…based on their own claim to insider’s knowledge” has become public policy and sanctified by Regulatory Medicine. Physician Suicide 101: Secrets, lies and solutions by Dr. Pamela Wible, M.D., is now featured on KevinMD.com. Please read and comment! We need to use this as a stepping stone to start discussing the Elephant in the room; state Physician Health Programs (PHPs) organized under the Federation of State Physician Health Programs. These programs once served the dual purpose of helping sick doctors and protecting the public from harm. 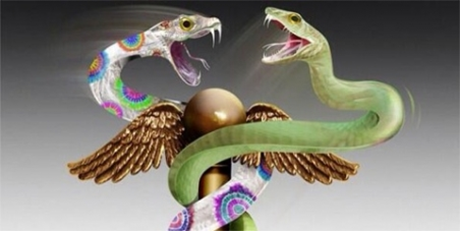 Taken over by the “impaired physician” movement the current manifestation is one of absolute power and unrestrained managerial authority with no meaningful oversight, regulation or accountability. It is a culture of institutional injustice that is preventing doctors from seeking help for fear of being ensnared and monitored by them. Those being monitored by them are subject to bullying, abuse and forced 12-step indoctrination under threat of loss of licensure. Many of these doctors do not even have an addiction or substance use disorder. Situational factors, a “one-off” or even a false accusation can result in monitoring by these programs that encourage confidential referral for things such as being behind on medical charts. Sham peer-review is rampant. 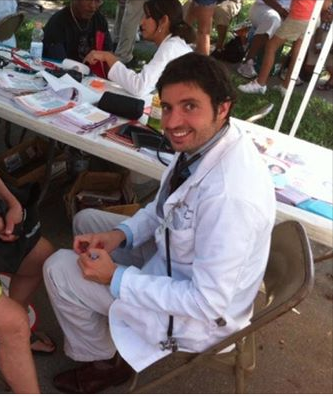 Dr. Gregory H. Miday (1982-2012) A Doctor who would have made this world a better place. This is a Public Health Emergency that is not going away. It needs to be addressed directly and with urgency; not with kid gloves and temporization. Accountability is without exception. It requires both the provision of information and justification for actions. Accountability also requires consequences for actions if they breach standards-of-care, ethics and the law. Hopefully this article will succeed in framing certain questions for the medical profession; questions that we all need to think about now before the door closes for good. Physician Health Programs use a doctor’s medical license as “leverage” in what they call “contingency management.” What this means is that a doctor who is being monitored by a PHP must comply with any and all demands of the PHP under threat of being reported to the state Medical Board and loss of licensure. Dupont wants to extend the PHP model to other populations including kids. The 2013 American Society of Addiction Medicine White Paper on Drug Testing describes the organizational structure of the “New Paradigm” which includes utilization of the medical profession as a urine collection agency for their drug and alcohol testing. When a doctor-patient relationship exists the testing is rendered “clinical” rather than “forensic.” Thus the consequences of a positive test can be deemed “treatment” rather than punishment. This bypasses the strict chain-of-custody and Medical Review Officer requirements designed to ensure accuracy and minimize false-positives. Forensic drug testing is tightly regulated because the results a positive test can be grave and far reaching. Erroneous results are unacceptable. As onerous, unwarranted and unjust as this future dystopia sounds it may very well come to fruition. Across the country doctors have been going to the media, law enforcement, and the ACLU complaining of ethical breaches, civil rights violations, abuse and criminal activity only to be turned a deaf ear. The Federation of State Physician Health Programs has been able to construct this scaffold with no meaningful opposition and below the public radar. They have done this by removing accountability at all levels. By preventing access to information and erecting a system without oversight no consequences exist to deter misconduct and abuse. The same tactics and strategies will be used as they expand this to other populations. The American Society of Addiction Medicine exists to trump the 12-step chronic relapsing brain disease model of addiction as defined by A.A. The authoritarian view necessitates the authority maintain authority so everything is engineered around that goal. The PHP model is built on the very foundation Hoffer describes. “Addiction Medicine” not a recognized medical specialty. This begins with the ASAM itself. “Addiction Medicine” and ABAM “board certification” is not recognized by the American Board of Medical Specialties. The requirements for this self-certification are not commensurate with ABMS certifications and only requires a medical license and board certification in ANY specialty. Federal workplace drug testing is done in accordance with mandatory guidelines. This testing is regulated using FDA approved tests with established sensitivity, specificity, and cutoff levels. FDA approval requires rigorous research and proven validity. The FDA requires valid scientific evidence (with both clinical and analytical validation) The FSPHP has introduced non-FDA drug testing via a loophole that removes accountability. The EtG, EtS, and PEth tests were introduced as Laboratory Developed Tests (LDTs) with little evidence base. The LDT pathway was developed for “clinical” tests of low market potential that would not otherwise make it to market as the FDA approval process would be prohibitive. An LDT does not even require in vivo testing or proof that the test actually tests for what it s claimed to test. Without FDA oversight, however, the labs can claim anything they want with no accountability. After getting the labs to develop the tests the FSPHP then convinced the Medical Boards they were both necessary and accurate and began using them on doctors in PHP programs. In 2012 Drs. John Knight and Wes Boyd recommended the medical community outside of PHPS provide oversight and demand accountability. As with the NC PHP audit, Ethical and Managerial Considerations Regarding State Physician Health Programs generated little interest from the medical community at large. Because addiction is currently defined as a disease, addicts must be “treated” (which in the United States is more often coercive than voluntary), and “cured” (which is defined as remaining abstinent). When the disease concept is not strictly reserve for medical conditions but is expanded to any and all drug and alcohol use. 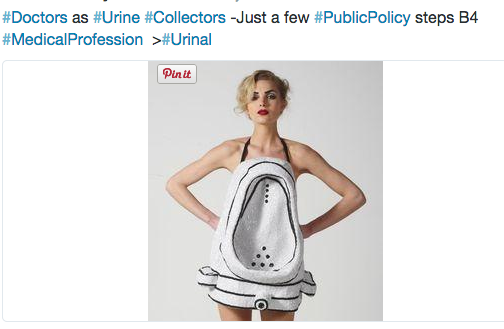 And this is how the ASAM “New Paradigm” will encroach upon others. This is why the ACLU needs to get involved. This is not just about doctors but about the future of society. The ASAM white paper contains the following quote minimizing the critical role of the MRO in drug testing. They feel clinical testing is good enough. And unless you want mandated random drug and alcohol testing at your physician visits using non-FDA approved testing with swift and certain consequences you will need to speak up. This occurred in the medical profession rapidly and with little notice. And that is how it will occur in other venues. 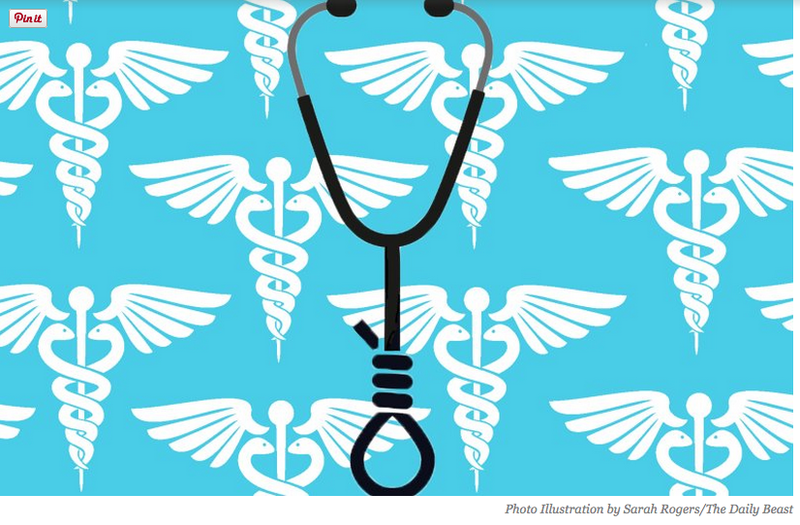 State Physician Health Programs have no meaningful oversight or accountability. Across the country doctors are reporting ethical and civil rights abuses and even criminal activity to law enforcement, the ACLU and the media. With the exception of North Carolina their complaints were patently ignored. Feeling hopeless, helpless, defeated and entrapped many are killing themselves. Institutional justice is a protective factor for preventing suicides. None exists here. The North Carolina PHP audit revealed conflicts-of-interest and no oversight by the state medical society or board. The audit also found that abuse could occur undetected because of this lack of accountability. There seems to be a willful ignorance or apathy regarding PHPs. Perhaps most take the side of the PHPs complacent that these are just helping sick doctors and protecting the public the complaints are nothing more than “bellyaching.” In reality the misconduct and abuse perpetrated by the PHPs is commensurate with the behavior of Dr. Farid Fata, the Detroit Oncologist who intentionally misdiagnosed patients with cancer so he could make money off unnecessary chemotherapy treatment. Dr. Fata’s egregious betrayal of trust and unconscionable acts generated a flurry of comments. His vile acts resulted in an appropriate response. The exact same misconduct is being perpetrated by PHPs but being overlooked, justified or otherwise ignored. Dr. Fata intentionally misdiagnosed patients with cancer who did not have cancer so he could give them chemotherapy to make money. PHPs are intentionally misdiagnosing substance abuse and behavioral disorders in physicians who do not have them in order to give them unneeded treatment and force them into monitoring contracts to both make money and gain control. It undermines the very integrity of the profession. It is particularly vile when the betrayal of trust involves doing the opposite of what was entrusted. Abuse of positions of power, trust and influence in the field of medicine need to be both prevented, recognized and addressed. Oversight, regulation and accountability are essential if this is going to be accomplished. There are no exceptions. Policies and procedures must be enforced in a consistent manner. The medical boards, medical societies, and departments of health have given the state PHPs carte blanche control and absolute power. They will not even investigate misconduct or even crimes. And the PHPs have convinced law enforcement that this is a parochial matter. 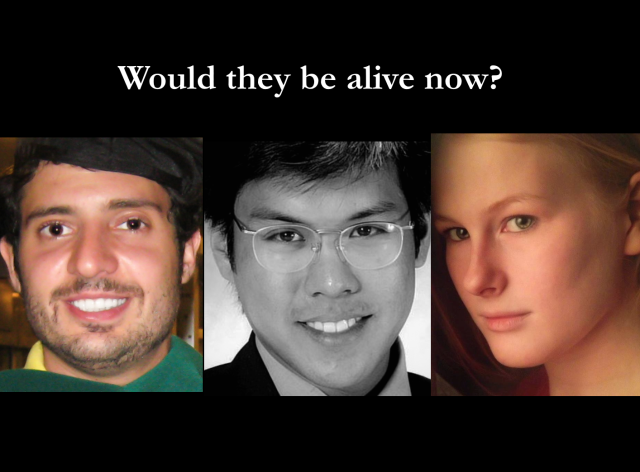 Doctors reporting crimes are often turned back over to the PHP. This refusal to investigate or even acknowledge valid and factual complaints of professional misconduct has not only prevented the exposure of wrongdoing and corruption but deepened it. How does wrongdoing and corruption serve the best interests of the public or promote public health? It doesn’t. How could a culture that protects the perpetrators of unethical and indefensible misconduct yet turns a deaf ear to their victims possibly contribute to the common good? It can’t. And giving an oppressive, illegitimate and irrational tyranny absolute power and granting them unrestrained managerial prerogative over doctors is fallacy. I have in quick determination…….. It shall be so. Madness in great ones must not unwatched go. According to Radar Online Robin Williams is looking “grim and focused.” Grim? Yes. Focused? No. His visage is one of entrapment, despair, and dread. In F. Scott Fitzgerald’s The Great Gatsby, Nick Carraway observes that “the loneliest moment in someone’s life is when they are watching their whole world fall apart, and all they can do is stare blankly” This is not focus but melancholia–hopelessness, helplessness, and defeat. These requirements were made because I requested an independent evaluation at a non-biased non-12-step assessment center not affiliated with the ASAM. The choices PHS gave me were all 12-step facilities with Medical Directors who can be seen on this list. My request for an independent evaluation was justified as the MRO for PHS is on the same list. The same MRO who allowed PHS to misrepresent the positive EtG tests and fabricate a confirmatory positive PEth. PHS claimed that I had been told to discontinue medications used to control and treat lifelong asthma. I had not. 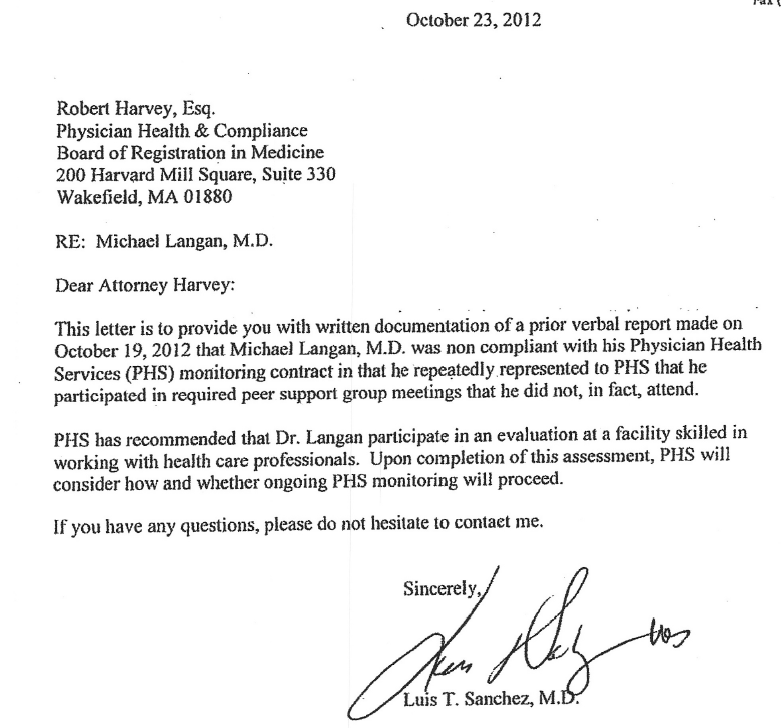 I provided the Board with multiple documents contradicting PHS claims. After discussing alternative options with my PHS associate director, John Knight, M.D., it was decided to continue them as prescribed. This decision was based on the history and severity of my asthma and the good control and treatment these mediations provided. As a child and young adult I had multiple emergency room visits and was hospitalized several times for asthma, but the medications had prevented any serious asthma attacks for the previous 10 years. The documentary evidence shows that PHS acknowledged the prescribed medications, considered me compliant, and advised I continue to use them. No EtG tests were done until June 20 and June 30, 2011. PHS reported these as “positive” by claiming I was told to discontinue my asthma medications. I provided the Board with multiple documents that contradict this claim and suggested that Dr. Knight be contacted to verify this was untrue. I also requested written documentation to support PHS claim. The Board ignored the contradictory documentation, did not contact John Knight, and neither PHS nor the Board could provide any documentation to support the claim that I was told to discontinue the medication. They still haven’t. 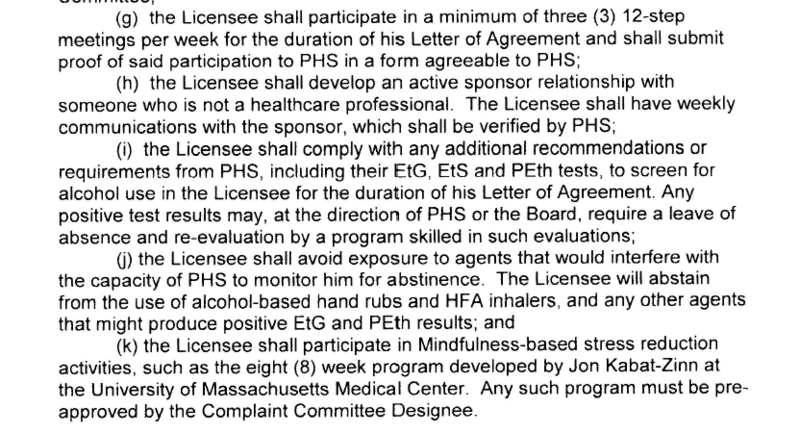 Reporting a positive test to the Board for a prescribed and acknowledged medication would be in violation of the PHS monitoring contract. Claiming the medications were discontinued allowed PHS to report these tests as true positives and also do a “confirmatory” test. The Etg was used as a stepping-stone to order a blood being used by Physician Health Programs to differentiate “incidental” exposure from drinking. They were aware of the medications, aware they contained ethanol, and aware that they caused positive Etg levels but reported it anyway under the pretext that I was told to discontinue the medication. This misrepresentation was then “confirmed” by fraud. There is no known cutoff level for Etg to differentiate incidental exposure from drinking. It should be noted that the use of ethanol containing metered dose inhalers is not “incidental” exposure but “direct” exposure and reporting them as positive violates all established protocols and guidelines. PHS then used forensic fraud for confirmation. On July 1st, 2011, Dr. Gary Chinman of PHS informed me that I had positive EtG tests on June 20th, and June 30th, 2011. I was told to go to Quest Laboratories to obtain a confirmatory blood test. On July 19th, 2011 I was informed that the test was positive at a markedly high level of 365. The cutoff level of PEth is 20 and a level of 365 suggests heavy sustained alcohol use. Common sense would have dictated this to be erroneous at this point based on my appearance, work performance, and all collateral information. 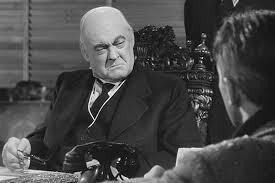 I immediately requested evaluations from my PCP and the Chief of Addiction Medicine at MGH. They both did full evaluations (including speaking with my supervisors and colleagues, physical exams, and laboratory tests ) and wrote letters to the Board contradicting PHS claim. 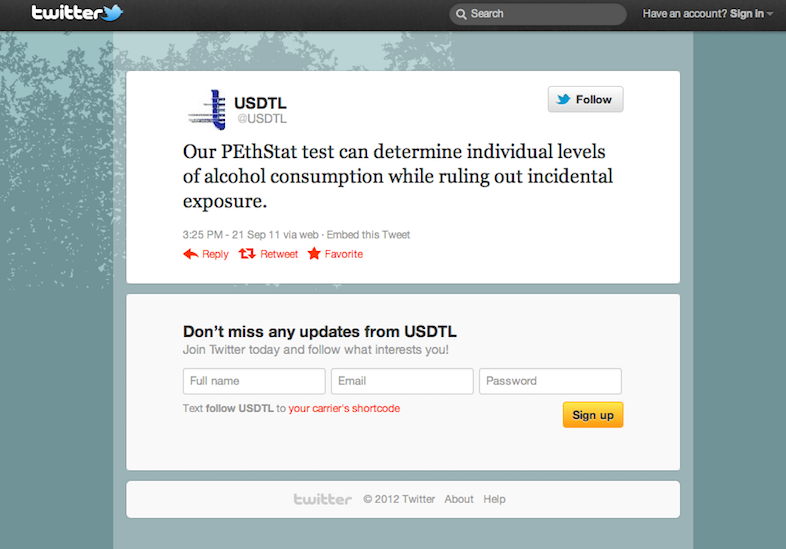 The Board was well aware that no other pretext existed to suggest alcohol use except for these tests. The Board ignored all outside information and continued to support PHS. Suspecting the test was fabricated I requested the “litigation packet.” PHS initially refused. I persisted in obtaining the results and PHS finally agreed but threatened me with “unintended consequences.” I received the “litigation packet” in December of 2011 and it revealed fraud. A fax dated July 19, 2011 from PHS to USDTL requested that my ID # (1310) and a chain-of-custody be added to an already positive specimen 19 days after it was collected. The test has since been invalidated as a result of a complaint filed with the College of American Pathologists (CAP), an accrediting agency for the labs. To sum this up I knew that the test was fabricated at the time and it was subsequently verified as fabricated ), I simply wanted a fair and objective evaluation from an assessment facility with no conflicts of interest. 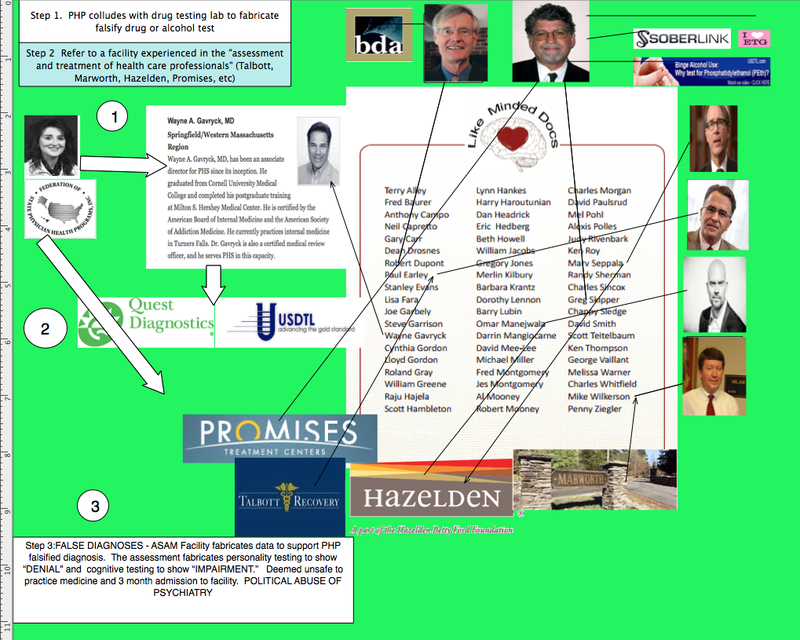 Marworth, Hazelden, or Bradford were the three choices given–all heavily indoctrinated ASAM facilities with close ties to the state Physician Health Programs. Interestingly, PHS had mandated thrice weekly 12-step meetings for a duration of three months. The Board took it upon themselves to extend it from three months to 2-years–an ultra vires act outside the scope and power of the Board and an obvious Establishment Clause violation. The Board also gave PHS carte blanche managerial prerogative to “submit proof of said participation” at the thrice weekly 12-step meetings. PHS chose names and telephone numbers of fellow attendees at anonymous meetings as the burden of proof! I informed the Board that obtaining unique identifiers such as names and telephone numbers to provide to a State substance abuse monitoring agency would be a tall order as “anonymous” is half its name. They did not take this into consideration. PHS also mandated under threat of my license that I could no longer use the asthma inhalers that had been controlling my asthma for the past decade. But the requirement that I humiliate myself by attending meetings at which I don’t belong and try to convince anonymous attendees to breach their anonymity wasn’t enough. I had to do it while wheezing. The Board forbade me from any of my asthma MDIs and essentially all of the propellants were replaced with ethanol by Federal mandate to protect the Ozone. Dr. Knight and I looked into alternatives previously and decided that due to the severity of my asthma and the control achieved by my current medications I would continue them as prescribed. As cold and exercise were two major contributors to asthma attacks I had to stop going to the gym and I had 19 major asthma attacks during that winter. My PCP documented the wheezing and shortness of breath at my checkups. And to kick a wheezing fellow asking inappropriate requests at A.A. while he’s down, the Board extended PHS requirement of thrice weekly mandated AA meetings from 3 months to 2 years on their own accord. This is an inappropriate ultra vires act by the Board. It is outside the scope of their authority and an obvious Establishment Clause violation. 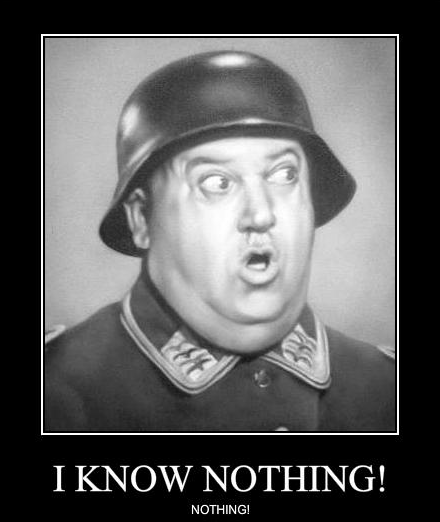 It soon became apparent that my attorney was doing nothing. At a meeting with PHS I told them that getting names and phone numbers at 12-step meetings was inappropriate and that Dr. Chinman was asking personal questions. My attorney turned to me and said “Well they have to ask questions. They need to make sure you’re not just paying somebody to say you were at a meeting? It then dawned on me that he had insisted on blaming the positive PEth test on my asthma inhalers and never even contacted the labs. He also refused to call Hazelden to verify that they had not made the request for phone numbers. I was told that this is the case with most PHPs. They refer you to a few attorneys who they know well and give a lot of business who will not bite the hand that feeds them. Another component of this rigged game. It has now become clear why this occurred at this time. Nevertheless the Board has outlined the decision making process from beginning to end right here in the February 6th, Board Order. The modified Letter of Agreement specifically states that I must attend 3 “12-step” meetings per week and obtain a “sponsor.” No alternatives were offered and it is well established that mandated AA or 12-step by the State is in violation of the 1st Amendment. The Board then suspended me for allegedly not complying with the 12-step requirement. My suspension was, in fact, an Establishment Clause violation. This non-response is unacceptable. The Establishment Clause violations have been pointed out to the Board. Whether or not I have an open matter with the Board is irrelevant. Who identifies the violation is irrelevant as the law is clear on this matter. The Proof PHS required was the name and phone number of a fellow attendee who they could call to verify my attendance. PHS mandated thrice weekly 12-step meetings per week for 3 months then once per week. The Board then again violated the Establishment Clause by taking it upon themselves to lengthen my sentence. and extended it from 3 months to 2 years. The act of obtaining phone numbers at anonymous meetings not only violates the rights of the person being forced to do it but the rights of the other attendees. The basic tenet of AA is that it is for people who desire to be there and the spiritual foundation of is anonymity. Anonymity, by definition, refers to an individual’s personal identity, or personally identifiable information, being unknown. Signing a first name to a card provides anonymity. Providing a first name and a telephone number most assuredly does not as it is a unique identifier, not unlike a social security number or driver’s license number, and can easily be used to uniquely identify that person. Consequently, trolling for phone numbers to be given to an unfamiliar non-governmental state affiliated agency from anonymous members of a categorically anonymous group that considers anonymity as the spiritual core of its existence, presents a tall order. Nevertheless, despite being half of its name, the BORM accepted the statement from PHS that obtaining names and phone numbers at 12-step meetings was accepted without question and I was not allowed to challenge or question the decision before the BORM. Difficult as it was, I was able to provide them with phone numbers despite PHS’ attempts to make it as difficult as possible as documented in the attached e-mails and letters that include my concern that this Sisyphean task was merely designed as a failsafe to deem me noncompliant with the BORM should the need arise. It was. In addition to coercion PHS continued to engage in threats, intimidation, and “torture” (an act committed by a person acting under the color of law specifically intended to inflict severe physical pain or suffering upon another person within his custody or physical control). On 11/8/2012 the BORM found I was in violation of this agreement and referred the case to the full Board for sanction based on alleged “noncompliance” with the ordered attendance. The First Amendment states in the “Establishment Clause that “Congress shall make no law respecting an establishment of religion.” Acts of direct coercion, threats backed by legal sanctions, are barred by the Establishment Clause. Legally, Alcoholics Anonymous is established as a religious organization. And so is Narcotics Anonymous. This is well established and as far as United States courts are concerned AA and NA are, beyond a doubt, organizations that engage in religious activities and their meetings qualify as religious services. Was the object of the coercion religious rather than secular? Develop an active sponsor relationship and provide consent for this sponsor to confirm twice a year with PHS that he/she is your sponsor. The Board wrote this up in the letter of agreement without offering any other options. Coercion-point two—also is clearly present by force of law and threat of penalty. The elements of coercion are 1. A forced choice, 2. Threat of sanction, 3. Coercive ijntent. The BORM states if I attempt to negotiate or dispute PHS’ recommendation I will be “immediately suspended.” Your money or your life. Mandating phone numbers as proof of attendance makes this particularly egregious as they inappropriately demanded I engage in a religious based program and violate the basic principles of the program (anonymity). Moreover, the request for mandated 12-step attendance was not made out of “good faith” or beneficence. It was a retaliatory act designed to punish me because I questioned the results of a drug test that was done on July 1st, 2011 and reported as a confirmatory positive for alcohol use. Because PHS had previously (2008) misrepresented the results of a drug test to justify sending me to an out of state facility for an evaluation where the facility fabricated neuropsychological testing to support “denial and cognitive impairment” resulting in forced inpatient rehabilitation I requested that the BORM allow an evaluation at an independent facility that did not have a referral relationship with PHS (and the inherent conflicts of interest that exist).4 The BORM would not consider the requests, said I had to go to one of the choices I was given, and added to more years to my contract because I had the audacity to request an alternative. I also requested the laboratory (USDTL) “litigation packet.” Considered a legal document, this record is generated in any forensic (as opposed to clinical) laboratory -testing, and records the collection, shipping, handling, and testing of the sample. It is done to document that a drug test was done correctly on the person it was supposed to done on. It follows a specific protocol that involves strict chain of custody followed by MRO review. 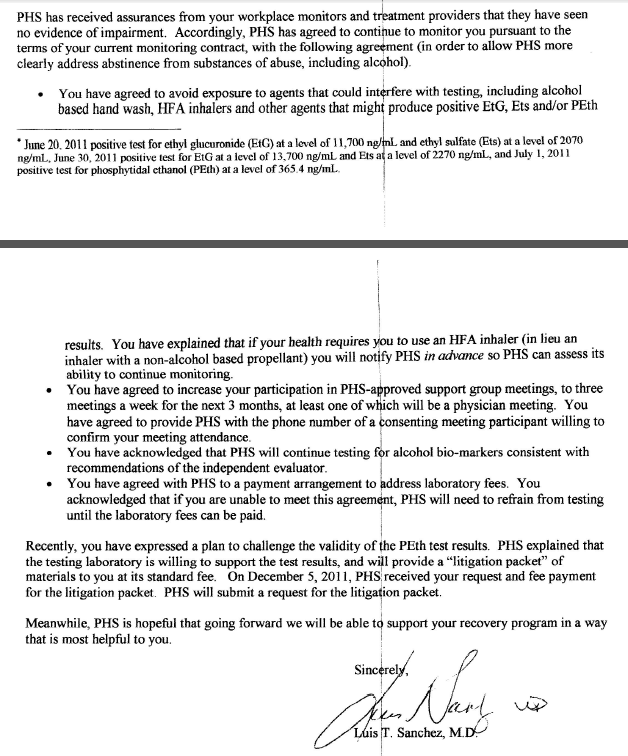 PHS was resistant to my request for the “litigation packet,” but I eventually got it and, as Dr. Flood’s opinion letter shows, the test was fabricated. Chain of custody was nonexistent. The BORM refused to look at it. I filed a complaint with the College of American Pathologists (CAP) and an investigation was done which showed that the test was manipulated. Although the lab was sanctioned under threat of losing accreditation by CAP, as a non-governmental organization with no regulations and accountable to no one, PHS continued to support the validity of the test. On December 4th, 2012 I got the following e-mail documenting that the laboratory issued an amended report mandated by CAP that showed the external chain of custody was not followed and thus making it an invalid test. The BORM did not consider the logic that the very basis for my forced attendance at AA meetings and all of the other negative consequences thrown at me was this very test. Nor did they take into consideration the fact that the amended report was issued in October and the temporal relationship to them finding me out of compliance with AA meetings. 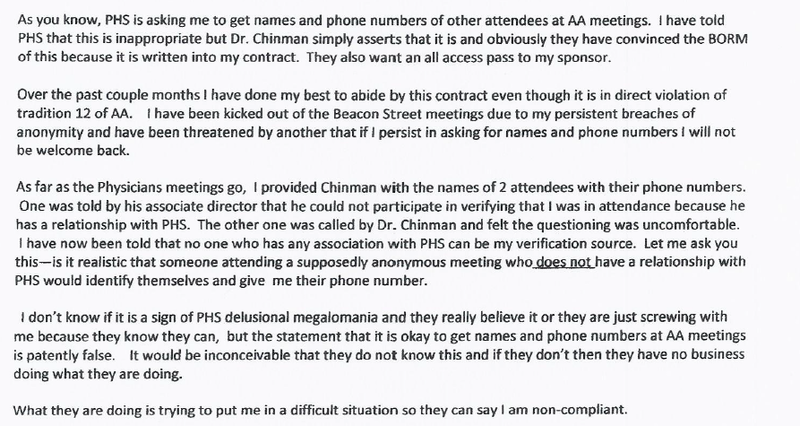 Instead, the BORM found me out of compliance with PHS which is essentially a lie (noncompliance) based upon a lie (saying that Hazelden recommended 3x per week AA meetings with phone numbers) based upon a lie (a fabricated test). But the forensic fraud, “color of law” abuse, Civil rights violations, harassment, intimidation, and abuse qualifying as criminal harassment under 42 U.S.C. Â§ 1983 -subject to a systematic scheme of harassment and intimidation Personal humiliation, embarrassment and mental distress) and arguably a violation of the Bill of Rights under cruel and unusual punishment are irrelevant. So too is the arrogant over-the-top bizarrely inappropriate request for phone numbers. Even without these factors entering the picture the Establishment Clause violations are clear. And the fact that they ignored the request to remedy a Civil rights violation is indefensibly unconscionable. They acted with malice, willfulness, and callous and reckless indifference to the safety and rights of my family and me. The “Right to be secure in one’s person” is an aspect of liberty protected by the due process clauses of both the Fifth and Fourteenth Amendments. And “Liberty” is Constitutionally protected by both the Fifth and Fourteenth Amendments, and also a protectable deprivation of due process. The liberty interest is violated and actionable by any conduct of persons acting under color of law that “shocks the conscience” (Massachusetts Civil Rights Act is M.G.L. c. 12 Â§ 11I). The First Amendment states in the “Establishment Clause that “Congress shall make no law respecting an establishment of religion.” Acts of direct coercion—threats backed by legal sanctions—are barred by the Establishment Clause. Three federal courts have held that coerced participation in 12-step programs like AA and NA violates the First Amendment. In Kerr v. Ferry, 95 F.3d 472 (7th Cir 1996), the Seventh Circuit held that requiring an inmate to attend NA meetings or risk suffering adverse effects for parole eligibility violated the Establishment Clause. The Second Circuit reached a similar conclusion in Warner v. Orange County Department of Probation, 115 F.3d 1068 (2d Cir. 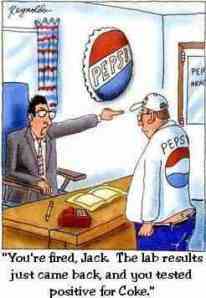 1997), striking a probation condition requiring attendance at AA meetings. In 2007 the Ninth Circuit Court of Appeals held that a parole officer’s demand that a convicted drug offender attend Narcotics Anonymous violated the First Amendment rights of the offender who claimed to be a Buddhist (Inouye v. Kemna, 504 F.3d 705 (9th Cir. 2007)). Moreover, the case ruled that “any coercing authority” can be held individually, civilly liable for the First Amendment constitutional rights violation that they perpetrate on people unwillingly and involuntarily forced to go to 12-step programs and the offender was free to sue the parole officer for damages, even though state officials are often immune form such suits. Warner and Inouye were able to go forward with lawsuits against their officers for damages for violation of their constitutional rights under 42 U.S.C. 1983. (Civil action for deprivation of rights). Numerous federal and district courts and state supreme courts have reached the same conclusion. What this means is that you can sue a judge, a prison warden, a parole officer, a “counselor, a medical board member, or anyone else in a position of authority who forces you to go to AA meetings. In cases like this the courts found that the government had forced the person to attend AA or NA. In other cases, where state of local officials simply made participation in AA one option for substance abusers, courts have no found any Establishment Clause violation. “For the government to coerce someone to participate in religious activities strikes at the core of the Establishment Clause of the First Amendment, whatever else the Clause may bar.” Inouye v. Kemna, 504 F.3d 705, 712 (9th Cir. 2007). The Ninth Circuit articulated the following test in Inouye v. Kemna “with regard to determining whether [Plaintiff] was [subject to] governmental coercion of religious activity . . . : ‘first, has the state acted; second, does the action amount to coercion; and third, is the object of the coercion religious rather than secular?’” Id. at 713. “First, [Crofoot] acted in his official state capacity as a parole officer to order [Plaintiff into a 12-step program that contained religious components]. 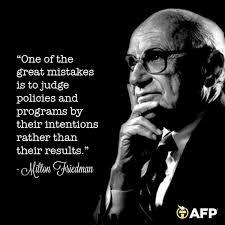 That the state did not run the program itself is ‘of no moment.’” Id. (quoting Kerr v. Farrey, 95 F.3d 472, 479 (7th Cir. 1996)). It is undisputed that Crofoot, Wilding, and Jallins were acting in their official state capacities when they required Plaintiff to participate in the 12-step drug treatment program as a condition of his parole, and subsequently removed and incarcerated him for not participating in the program. Shortly after arriving at Empire, I discovered that Empire used a “12-step” recovery program based [on] the principles of Alcoholics Anonymous (“AA”) and Narcotics Anonymous (“NA”), which contains religious components. Among other features, the “12-step” method used by Empire made references to God, involved acknowledgment of a “higher power,” and included prayer. [¶] I am an atheist, and was one in 2007. The substantial religious components to the “12-step” program administered by Empire conflicted with my beliefs. Prior to my release on parole, I had notified correctional authorities of my Atheism, and requested placement in a treatment facility that did not contain religious components. (Hazle Decl. ¶¶ 2, 3.) The Parole Defendants do not dispute that the Empire’s 12-step program contained religious components. “As such, on this summary judgment record and given the lack of dispute between the parties in question, . . . the third prong of [Plaintiff’s] Establishment Clause test has been met as well.” Inouye, 504 F.3d at 713-14. Therefore, “the program runs afoul of the prohibition against the state’s favoring religion in general over non-religion,” because of the program’s use of a religious concept of a Higher Power through references to God and prayer. Kerr, 95 F.3d at 480. Accordingly, Plaintiff’s partial motion for summary judgment against the Parole Defendants is granted. Coercion-point two—also is clearly present by force of law and threat of penalty. The elements of coercion are 1. A forced choice, 2. Threat of sanction, 3. Coercive intent.